This eating plan increases the number of calories a person burns and seems to reduce hunger, a new study finds. Most people can lose weight at first, but maintaining that slimmer figure long-term is notoriously hard. The body fights back, defending against weight loss by boosting hunger and food cravings, while at the same time slowing down metabolism. “That means that as you continue to lose weight, you have to keep eating less and less… even as your desire for those calories increases more and more,” Dr. David Ludwig, a professor of nutrition at Harvard School of Public Health, told TODAY. But a new study finds people who follow a low-carb diet after slimming down may have an edge at keeping the pounds off. Eating fewer carbohydrates boosted the number of calories burned, according to research led by Ludwig and his colleagues, published Wednesday in The BMJ. The findings may lead to better obesity treatment, the authors noted. The feeding study — which means every meal the participants ate was provided by the researchers — was one of the largest and longest ever done on the question of whether all calories are alike to the body, Ludwig said. Based on the findings, the answer seems to be a firm no. A moderate-carb diet, consisting of 40 percent carbs, 40 percent fat and 20 percent protein. A low-carb diet, consisting of 20 percent carbs, 60 percent fat and 20 percent protein. The researchers adjusted the participants’ calorie intake to keep their weight stable and they measured their energy expenditure. The composition of a person’s diet had a major impact on his or her metabolism in this study. The people on the low-carb plan burned off about 250 calories a day more than those on the high-carb diet, Ludwig said. In the low-carb group, those with the highest insulin secretion at the start of the study had even more dramatic results, burning up to 478 calories more per day than the high-carb dieters. The low-carb group also had significantly lower levels of ghrelin — known as the hunger hormone. Ludwig called the findings “striking” and consistent with the Carbohydrate-Insulin Model, which argues factors in the diet — particularly processed carbohydrates — raise a person’s insulin levels too high and drive fat cells to store too many calories. “There aren’t enough calories for the rest of the body and that’s what causing people — despite the fact they may have 50 or 100 pounds of extra body fat — to think they’re starving,” Ludwig said. Don't diet, don't rely on your willpower and don't fight your natural weight range, this expert advises. Low-carb diets, on the other hand, lower insulin and raise the hormone glucagon, which helps reverse that fat cell behavior, Ludwig said. Other research points to carbohydrate restriction as a main treatment for type 2 diabetes. “On a low-carbohydrate diet, the body may have better access to its calories — the fat cells aren’t hoarding them as much. So there are more calories available for the muscles, for the brain, liver, other organs,” he noted. It may explain why people who stick to a low-carb regimen burn more energy than those who don’t. Some foods create ‘starvation mode’? The biggest dietary culprits are highly processed carbohydrates, which produce hormonal changes that program a person’s body to gain weight, Ludwig said. They include white bread, white rice, potato products, prepared breakfast cereals, added sugars, and low-fat cookies and crackers. There’s no need to eliminate all carbs — you don’t have to go full Atkins or keto, but just focus on avoiding those highly-processed carbohydrates, he recommended. A Mediterranean diet, which includes carbohydrates from whole grains, fruits and vegetables, but has very little added sugar, may be fine for most people. But those who have a lot of insulin resistance or diabetes may benefit from cutting all carbs a great deal, Ludwig noted. He advised including a range of “delicious, nutritious” fat options such as nuts, nut butters, full fat dairy, avocado, real dark chocolate and “fattier and traditionally tastier” cuts of meat. Some experts not involved in the study were concerned about the eating plan. "The low carbohydrate diet contained a horrendous amount of saturated fat... which would increase blood cholesterol levels and risk of heart disease," said Tom Sanders, professor emeritus of nutrition and dietetics at King's College London. Other research shows people who ate a moderate amount of carbs lived longer than those who ate almost none. 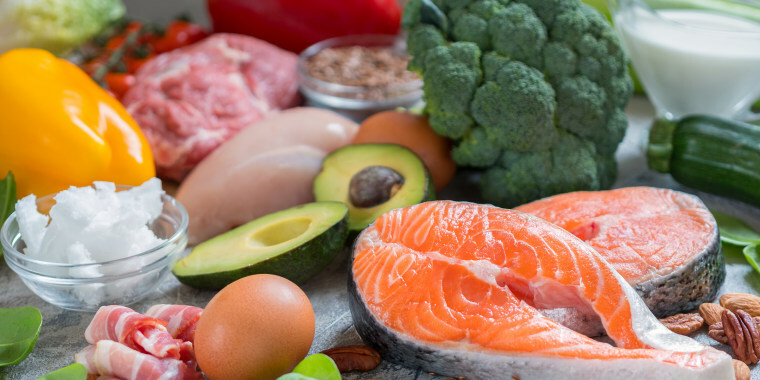 “That’s because most of the people who are on the low-carb diet are replacing those carbs with unhealthy things, particularly animal fat and animal protein,” said Dr. Roshini Raj, a TODAY contributor and associate professor of medicine at NYU Langone Health. Most studies show a plant-based diet is the best way to go, she added. The authors of the new study don’t know whether metabolism would eventually slow down on the low-carb diet, too, or whether a person would have to stay on that diet forever to maintain weight loss. Long-term studies are needed to answer those questions.